Greetings Me Like Eaters from the far, far West Side of Midtown Manhattan, aka Foodblivion. There’s precious little that warrants any attention in this neighborhood. It seems ripe for a good local go-to spot that has aspirations above merely being a greasy spoon or other dive. 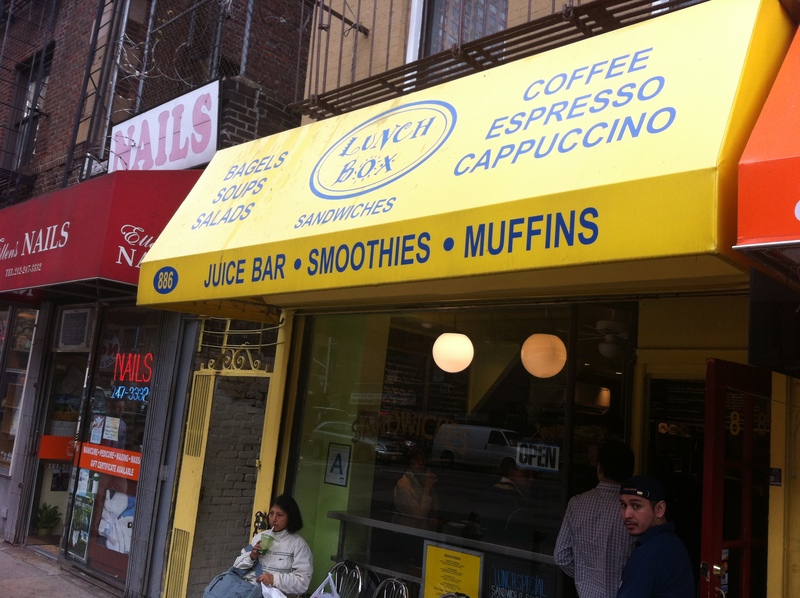 One place that quickly pops out is the Lunch Box, a hole-in-the-wall storefront on 57th and 9th. For those of us on the far far West side, this is already a hoof East to get to. But perhaps the hoof is justified. A line out the door is generally a good sign. There was a line out the door, which I think is testimony to the limited number of places that sell fresh food here in Foodblivion. 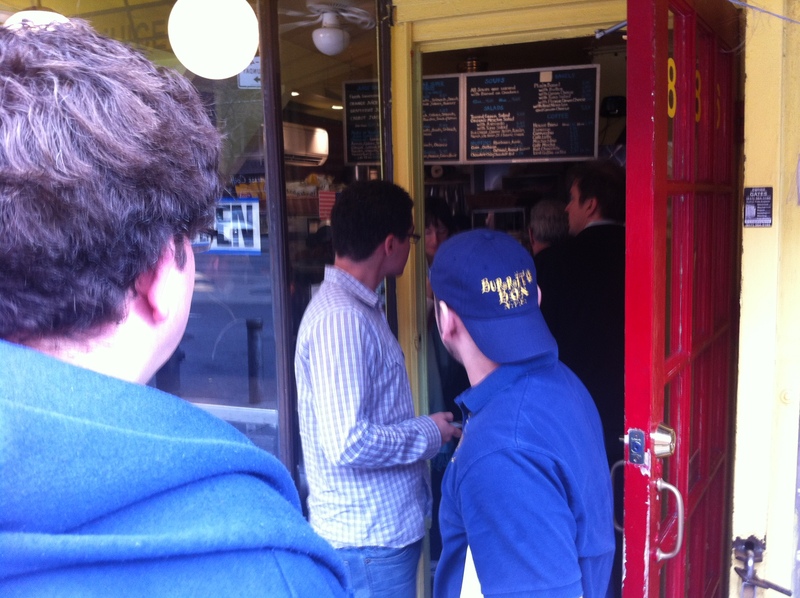 As you can see on the backwards cap of the gentleman on line, Lunch Box is the sister of the Burrito Box, which is pretty much on the direct opposite side of 9th Avenue between 57th and 58th Streets. There’s a limited selection of sandwiches, which I guess is because they want to keep to a core set of fresh ingredients. 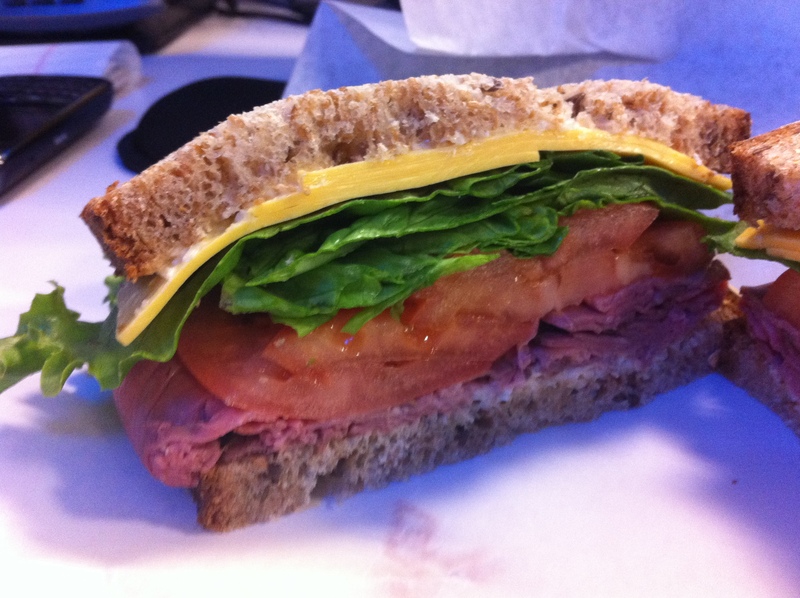 I selected roast beef, American cheese, lettuce, tomato and horseradish mayo (which clinches the sandwich) on multigrain bread.The American cheese and the mayo played well together, though frankly I was hoping for more zip out of the horseradish. Instead it seems like a faintly flavored cream. The bread was particularly good, very fresh. The rest of the ingredients were also of good quality. But is it enough to justify its nearly $9 price? I don’t know. Frankly, the freshness was welcome, but the flavor was nothing to write home about. At $8.35 for the sandwich, you really want it to knock it out of the park. It’s tasty, but… . When I think of some of the other amazing sandwiches I’ve had in this town, honestly, it can’t measure up for the price on a one-to-one comparison. But in Foodblivion, I’m not sure it has any challengers… .